Are you ready to make an impact? No matter the size of your company or the scope of your event, trust award-winning Pacific Domes for your commercial tent needs. Since 1980, Pacific Domes has been designing award-winning commercial tents that are engineered to be efficient, easy to erect and exceptionally durable. 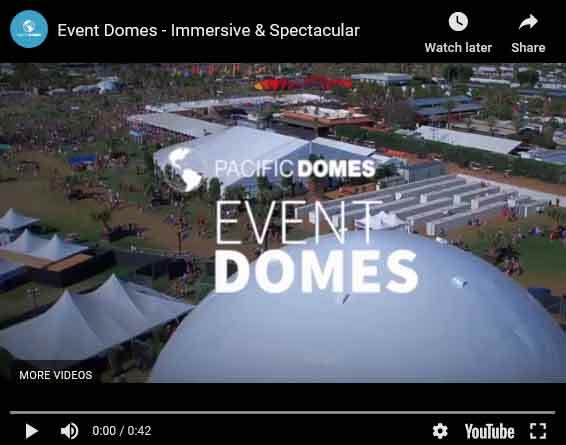 As the original designer and manufacturer of portable geodesic domes, Pacific Domes continues to produce the industry’s best commercial tents. We are committed to the most efficient and elegant architectural solutions. Whether at a music festival, trade show, convention or major league sports championship, our commercial tents draw in the crowds, providing unforgettable brand impressions against beautiful backdrops with unlimited social media potential. The power of our domes to spread brand awareness cannot be overstated. Our dome skins can be customized with colors, branding and images, to help you stand out even in the busiest settings. Our basic commercial tents are beautiful domes jacketed in your corporate colors and sporting your company’s logo. Everything is customizable and we offer all possible color combinations. Uses: Corporate Events & Conventions, Tradeshows & Tradeshow Booths, Product Launches & Promotional Tours, Sporting Events, Floating Domes, Ice Bars & Roof Top Lounges, Movie Sets, Private Parties, Special Occasions and Much More. 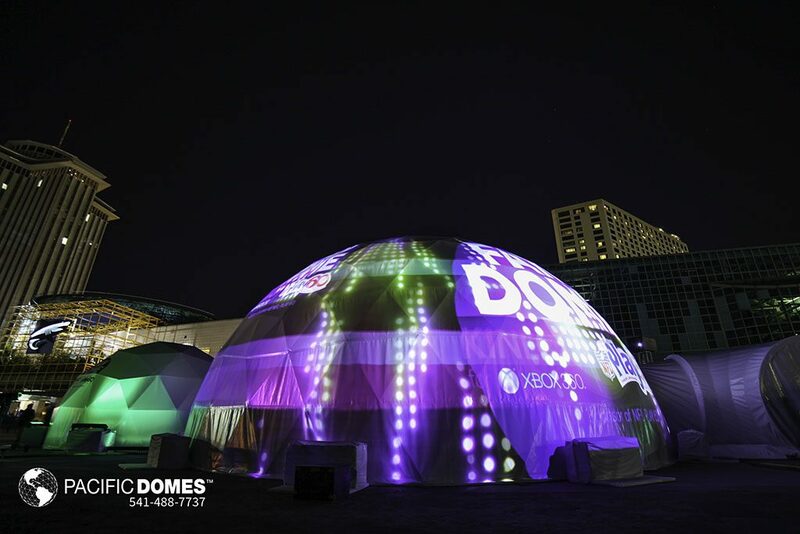 Take your commercial tent game up a notch with one of our Illumination Domes. The cover is made from EventLite fabric. Projections shine through the cover, visible from both the inside and the outside. Imagine your brand projected like a scintillating rainbow through the night. The festive atmosphere created by illumination domes yields impressive social media value as crowds gather to take photos against the projection backdrop. Projections can be seen for miles, spreading brand awareness far and wide. Uses: Festivals, Art Installations, Sporting Events, Corporate Events & Conventions, Tradeshows & Tradeshow Booths, Product Launches & Promotional Tours, Ice Bars & Roof Top Lounges, Movie Sets, Private Parties, Special Occasions and Much More. Our top of the line Projection Spheres provide totally immersive experiences that are unlikely to be forgotten. With projection mapping technology, 360-degree projections bring the inside of your dome to life, transforming it into another world. Blackout covers keep your projections tightly locked inside where the images play out in vivid detail. Uses: Planetariums, Festivals, Virtual Reality Spheres, Large Scale Corporate Events & Conventions. For the ultimate in commercial tents, combine the augmented reality inside the Projection Sphere with the colorful projections of the Illumination Dome on the outer cover. 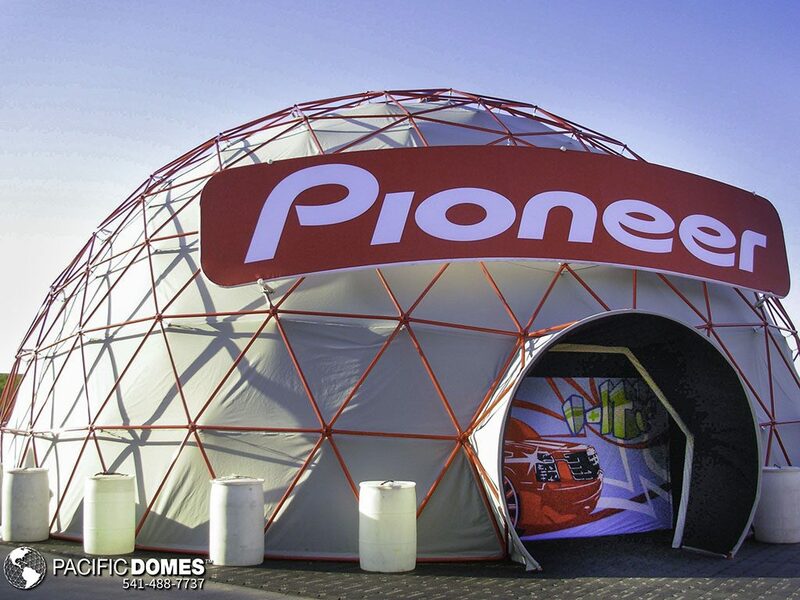 Our domes are easy to transport to any location and can be erected in virtually any type of terrain. They are perfect for large and small scale special events, because they are portable and can be erected and dismantled quickly. We offer complete customization in sizes ranging from 16-120’. Pacific Domes Event Domes have been celebrated by some of the world’s top companies. We are proud to have established relationships with world-renown corporations, including Audi, Canon, Coca-Cola, Geico, GM, Toyota and countless others. The futuristic ambiance of our geodesic domes is perfectly suited to any corporation that values innovation, creativity, and originality. Our expansive dome canopies are bound to make a lasting positive impression. 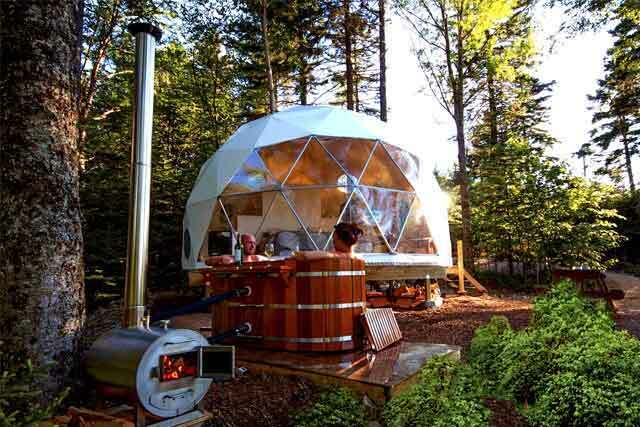 Pacific Domes is a family owned and operated ethical enterprise based out of Ashland, Oregon. We continue to produce the world’s best commercial tents. Next Post:Adult FOMO! Happy Place on tour!